Jenn and Romy: Almost done at UIC! I know I haven't posted anything for a long time, but that is because we are very busy now that school is over. I will update the blog a little later with some more news. Here are some funny pictures of me in my Bioe594 class at UIC. It is a class on microfluidics and microfluidic devices. We are making a micro-mixer, which is a device that takes two fluids and tried to mix them up together. 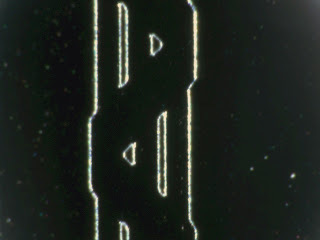 The channels of our device are very small (about 30 micrometers) and fluids at such small scales don't mix together. This is a picture of the people in our lab. We all look like big dorks! 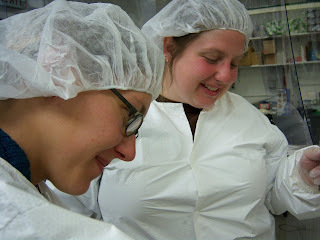 We are wearing white lab coats and hair nets because we have to do all of our work in the semi-clean room behind us (in the picture). No dust can get in our microfluidic devices, because the dust is almost as big as the channels that the fluids flow through! This is me and my lab partner M.E. inside the semi-clean room. We are mixing some ingredients (which you can't see) in this picture. We look happy, but that day was a Friday, and we had to stay inside there until 7:15pm! That sucked! 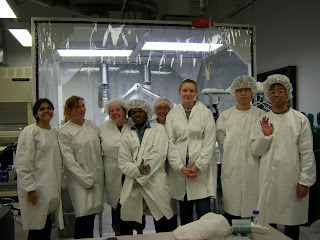 It was about 85F inside of the semi-clean room. This is a picture of our device under a microscope. The channel is really long ( about 18mm) but this is just one tiny section of it (less than 1 mm).